I'm struggling with one issue actually in SW Simulation Thermal. 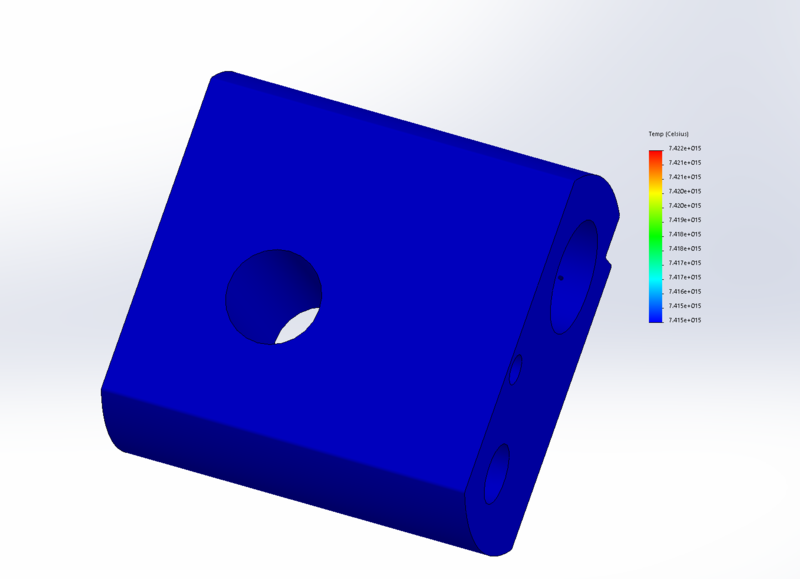 Can't find the reason why when I put the heat power to 50W or even 10W and that's the only Boundary Condition (attached to the face of one hole) that I have for this bracket I received those result with 7.42+e15 Celsius. It's impossible... It's stead simulation. Material Is AISI 304. What I do wrong? What I forget? Is there airflow in the model? Where do you have the heat going when it leaves the block? Nope. Just things that I mentioned only power heat, mesh, material. Thermal Steady State. I even Wonder if Part should have some other boundary condition like fix? So the heat is coming in and then... staying in the part? You need to give it a path to leave. You need a sink. Another boundary condition for the heat to flow to by conduction, convection or radiation. Yest, I know. And that is the tricky question. How to establish proper coefficient for convection? In SolidWorks is such a parametr by in physics there is nothing like that. What value should I use? Is the conduction boundary constrain a deflault one with geometry that is bonded? Where is the part being used? You need to set up the simulation environment to look like the application. What does your test set up look like? Well the convection is going to depend on the context of the part, you can't just guess something like that. This might be a job for Flow Simulation. Of course, and without convection proper the model will be non-physics. The problem is that convection is change with temperature of material as well. The question remains still how to do a flow simulation to find it? How look procedure for that? That's a separate SolidWorks add-in, it's called "Flow Simulation". It's a whole other software package.